Discussion in 'Pokémon Manga Discussion' started by shoz999, Oct 23, 2018. This is where you post images of some of your favorite official artwork of the Pokemon Adventures manga. When I say artwork, I don't mean comic panels, I mean literal colored paint-like artwork of the Pokemon manga. Don't know about you guys but are any of you reminded of Ken Sugimori's earlier paint-like artwork of the first two generations of Pokemon? Here's an example. We see Cyrus in the middle. For those who don't know, Cyrus's name means the Sun. What's orbiting around him are magnetic Pokemon, Magnezone and Probopass. They are the solar system and Cyrus is the sun. This is basically a subtle way of saying, Cyrus is the one in control, the one who is the boss of Team Galactic. Also what adds to this dark atmosphere is the paint-like textures, shading, the heavy use of the "blue" overtones. and how he interacts with his Pokemon by acting as the "sun". I recently got the "The Art of Pokemon Adventures" book for my birthday so I'll peruse that for some choice selections later . . . This is one of the coolest pieces of art I've ever seen. I don't know if this is official or a fan just put all the official art together but this is just AMAZING. In fact I feel like this poster isn't just a cool Gym Leader get-together artwork but is also artwork that hints at the big endgame storyline of the GSC chapter. This is official artwork. It's from the official website. It has not been updated for a long time, oh. You know what has been updated? The four original "Good" Gym Leaders of Kanto. Now if only we can A) see the "evil" Gym Leader of Kanto in updated artwork and B) see them in action in the upcoming possibly never happening Let's Go Arc! Edit: Never mind. It's official artwork. 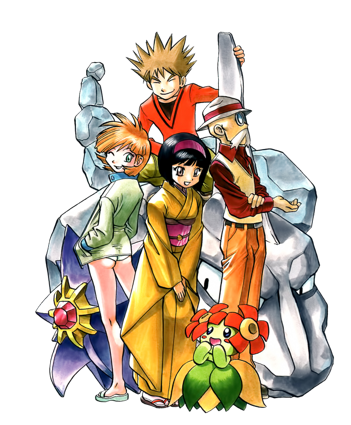 She drew for the Pokémon Adventures from Volume 1 to Volume 9, and she has a very distinct style to her art that differs from Satoshi Yamamoto. 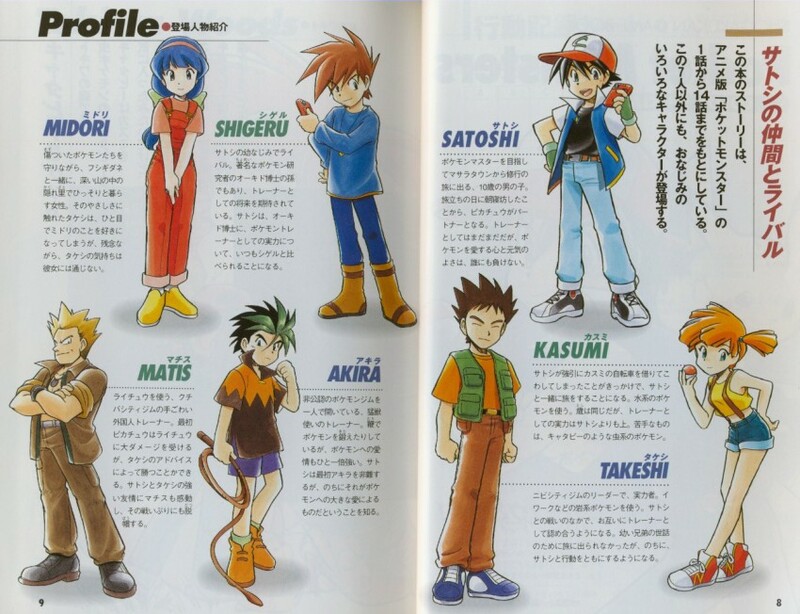 She even drew Ash Ketchum for some obscure Choose Your Adventure anime book that no one seems to have. Honestly I don't think you should leave it as a spoiler. You should leave it out in the open for any bypasser to see. That's an AMAZING find you found. I give credit to @Satoshi for showing these images to me a long time ago. As you can see, Mato has a very consistent style for Pokémon. In fact, I would say it is the Special style. Look at Satoshi. 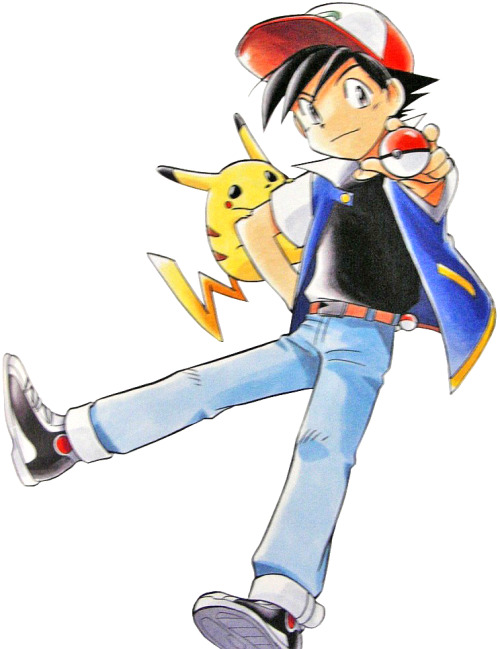 It's Red in Satoshi's clothes, down to a hairstyle closer to Pokémon Special than say, the actual anime. This was no accident given that Satoshi is anime Red. And it's clear that Mato had a particular vision for the world of the Pokémon Special. She is the reason why Red looks distinctly different from his game counterpart's design. Compare that to other Pokédex Holders in recent times, you'll notice that nearly all of them are heavily based on their game counterparts, with only minor distinctions be it Sapphire's sharp tooth or Y's short hair. I'm willing to bet that had Special's Red been made today, he'll be almost identical to his game counterpart's modern design, down to the same brown hair and body structure. It's a shame that the art books for Pokémon Special/Adventures don't showcase her works. Mato style is the foundation of Pokémon Special art that all future artists strive to emulate. This is an incredible find. If they ever make a History Behind Pokemon Adventures Book, they should definitely feature this. Don't know about you but I think Mato can return in certain feature arcs featuring the original style of 11 year old trios. The Diamond and Pearl story arc has some of those traces of Mato's artwork through how short and somewhat round the DPP crew are.